Industrial engineering theories and applications are facing ongoing dramatic paradigm shifts. 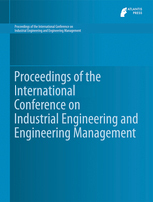 The proceedings of this series originate from the conference series 'International Conference on Industrial Engineering and Engineering Management' reflecting this reality. The conferences aim to establish a platform for experts, scholars and business people in the field of industrial engineering and engineering management allowing them to exchange their state-of-the-art research and by outlining new developments in fundamental approaches, methodologies, software systems and applications in this area, as well as to promote industrial engineering applications and developments of the future. The conferences are organized by CMES, which is the first and largest Chinese institution in the field of industrial engineering. CMES is also the sole national institution recognized by the China Association of Science and Technology. Co-organiser of the conference series is the Tianjin University of Science and Technology.